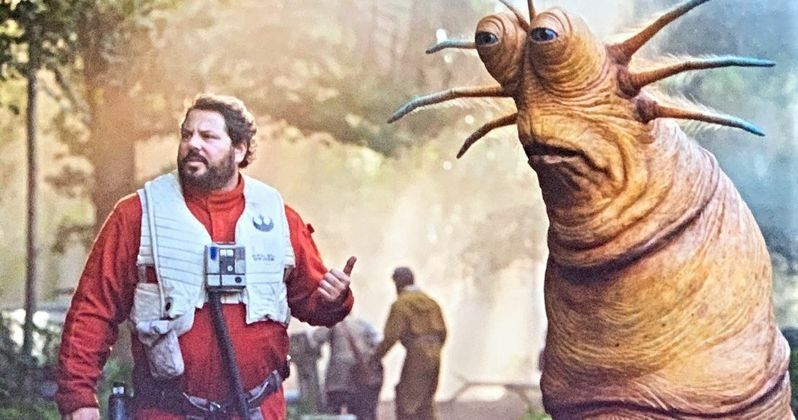 Well, the worm-like alien was introduced today at Star Wars Celebration in Chicago and his name is Klad. J.J. Abrams gave us the correct spelling of his name and says he's a fun character in The Rise of Skywalker and a friend of the Resistance. Chewbacca is actually responsible for bringing him to the fold, according to Abrams. Klad is featured on the leaked Star Wars 9 poster, along with the same costumes we saw the other characters wearing in the trailer. Along with the leaked poster, Star Wars fans were treated to character sheets, which correctly gave us the name of Naomi Ackie's Jannah character. She is also featured on the Star Wars 9 poster. This means Keri Russell's character really is Zori, though she was not featured in any of The Rise of Skywalker footage shown today. It's beginning to look like Mark Hamill was throwing some misdirection out there to keep fans from having anything spoiled. One of the things Mark Hamill took issue with was the fact that C-3PO has Chewbacca's bowcaster in the leaked Star Wars 9 poster. With that being said, it has been heavily rumored 3PO will have a larger role, which could end up with him being a warrior. Anthony Daniels, who has played the droid for over 40 years now, appeared at Star Wars Celebration and didn't spill anything, but he did imply people might start listening to the nervous droid for the first time. Again, the poster may not have been made for the public to see just yet, but it surely seems as if it was the real deal this whole time. The Rise of Skywalker poster was released today and it simply has the name and iconic logo on it surrounded by stars. It's simple, yet effective, and one can imagine the leaked poster we saw, or a design similar to it, will be unveiled as the release date gets closer. Many believed the leak poster was actually a promo poster to be used in retail stores for the big Merch push coming on Force Friday. As is the case with any of this, we'll just have to wait and see. The strangest takeaway about this whole thing is the fact that Klad is a real character and he looks really weird. Let's just hope he doesn't end up in Jar Jar Binks territory. The Klad info came to us from The Rise of Skywalker panel at Star Wars Celebration.